Instead of using applique in these designs you can use scraps of fabric, yarn, thread and other notions that you would normally discard. At this years embroidery party we have been stitching a design like this in class. The project goes along with a contest of which group can be the most creative. I am always amazed at what our attendee’s stuff into their designs. 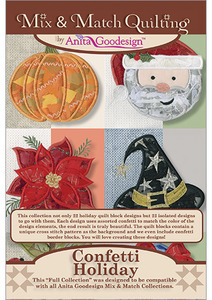 We decided to create not only 22 holiday designs but, 22 quilt blocks to go with them. Each of the designs uses assorted confetti to match the color of the design elements; the end result is truly beautiful. The quilt blocks contain a unique cross-stitch pattern as the background and we even include confetti border blocks. You will love creating these designs! There are 22 block designs and 2 transitional blocks in 4 sizes each (7.8”, 6.8”, 5.8”, and 4.8”). And 22 isolated designs in 2 sizes each (4.5” and 5.5”).